Have you ever worked on a space, and worked, and worked some more, only to feel like there was still something wrong with it. Making over a space takes a long time. One year we paint, next we add new window coverings, next we finally save up for that dream couch. We add one piece at a time until the room is finally finished. Well… I’m happy to say that my hallway is finally complete. 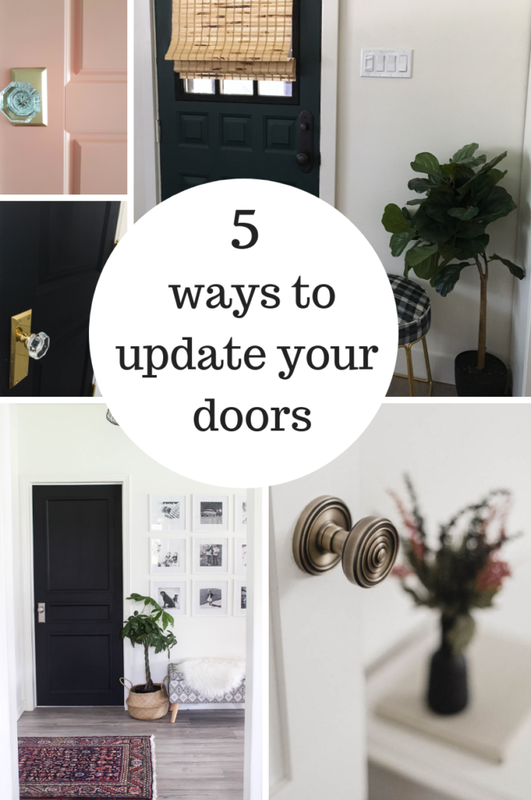 The last piece of the puzzle was changing the interior door design – and it was probably one of the easiest changes in the space! 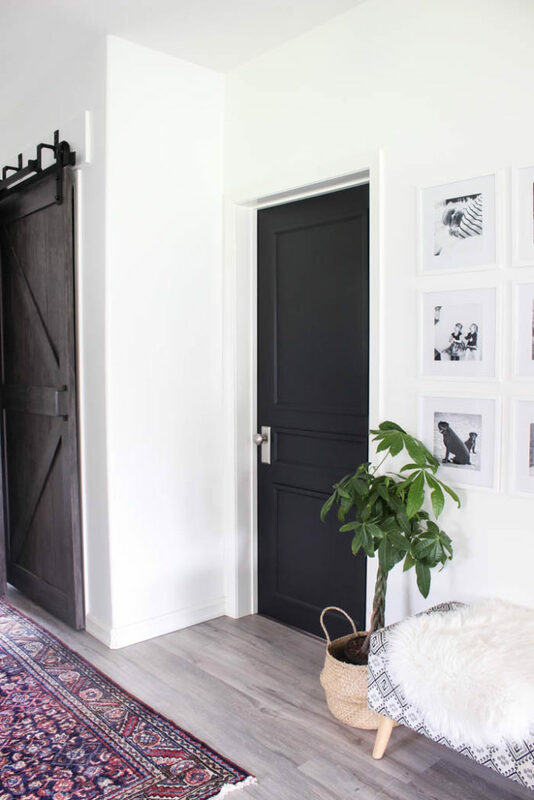 When we revealed our hallway decor early this year, did you notice that there weren’t many pictures with doors showing? lol. I was very strategic about my photo taking (which is hard considering there are three doors!). 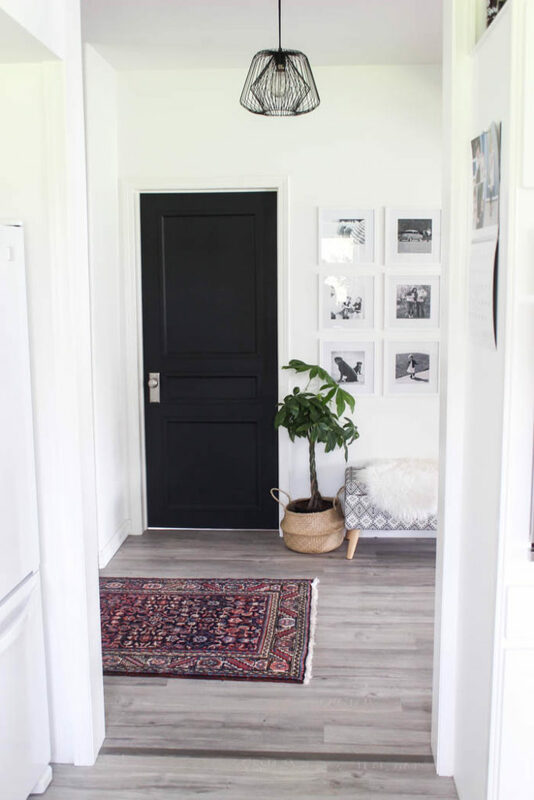 I loved the new decor, but I didn’t love the way it jived with the outdated wood doors throughout the hallway. So I came up with a three step plan: Trim. Paint. Hardware. Pretty easy right? It seriously was! Above is the picture of my husband and I putting a rudimentary pattern on the doors. We had to test it out with masking tape before we bought the trim to see if we were going to like it or not! 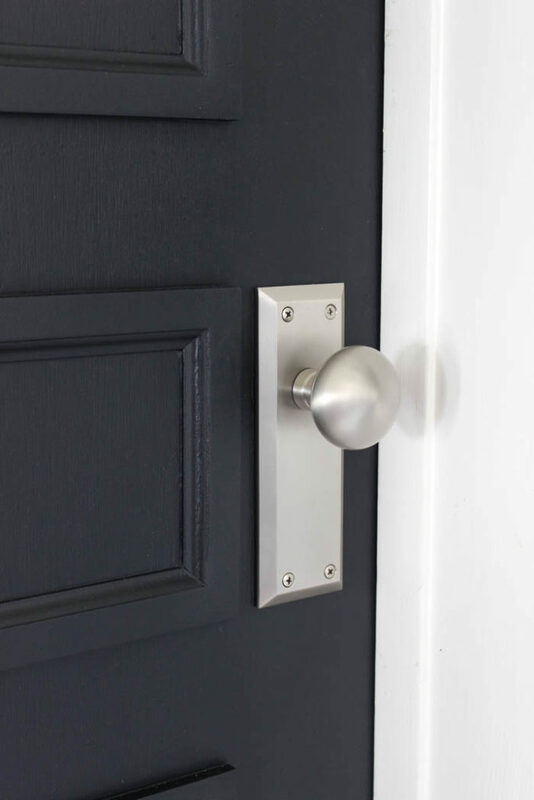 Measure out where you want your trim and draw the outline right onto your doors. 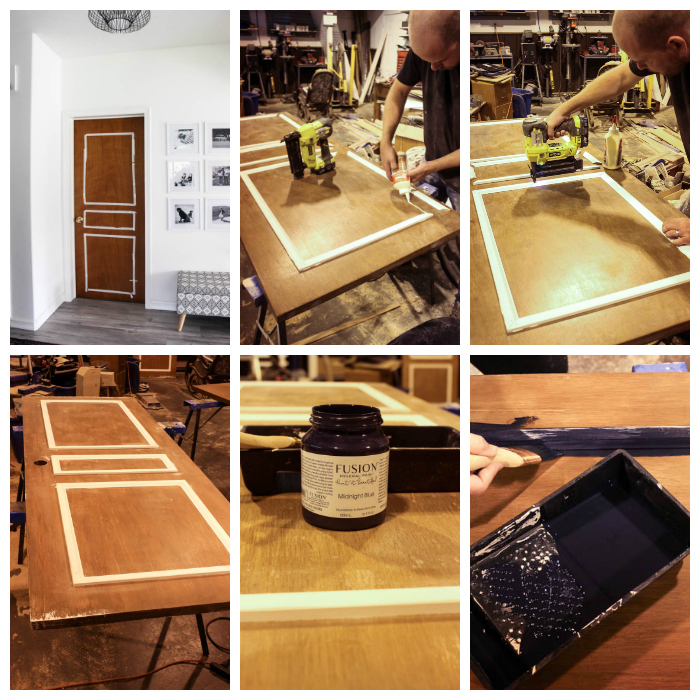 Our doors were actually all different sizes – and the knobs were at different heights! lol. 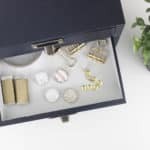 But in general, we tried to line up the middle box with our new hardware, and we left a 4.5″ perimeter on all outer edges, and a 3.5″ space between the trim boxes. Once you have the design, cut your trim pieces at the right lengths and at 45 degree angles to make the boxes. 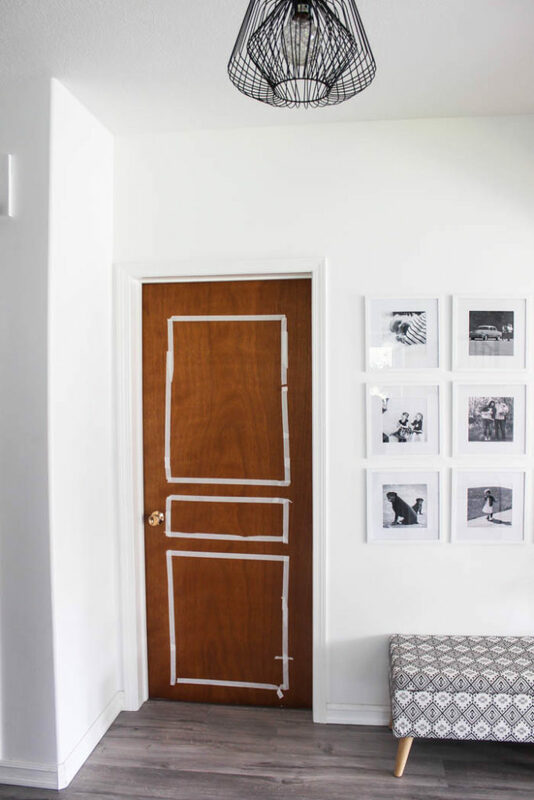 Attach your trim to the door with wood glue and a nail gun. Baaaahhhh! Look how different they are! All of the sudden my hallway looks finished and put together! I LOVE what the new and improved doors add to our space! And since I know you’re already drooling over my hardware… here’s the scoop! 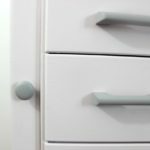 I got these knobs and long plates from Nostalgic Hardware and they. ARE. GORGEOUS. 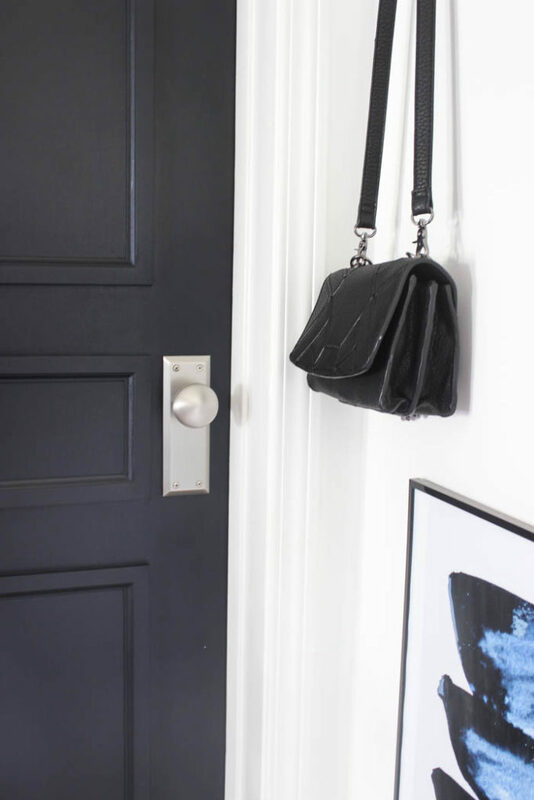 They are part of the Fifth Avenue collection, and guys… look at the impact that new hardware can make! I mean… seriously gorgeous stuff! And the paint! 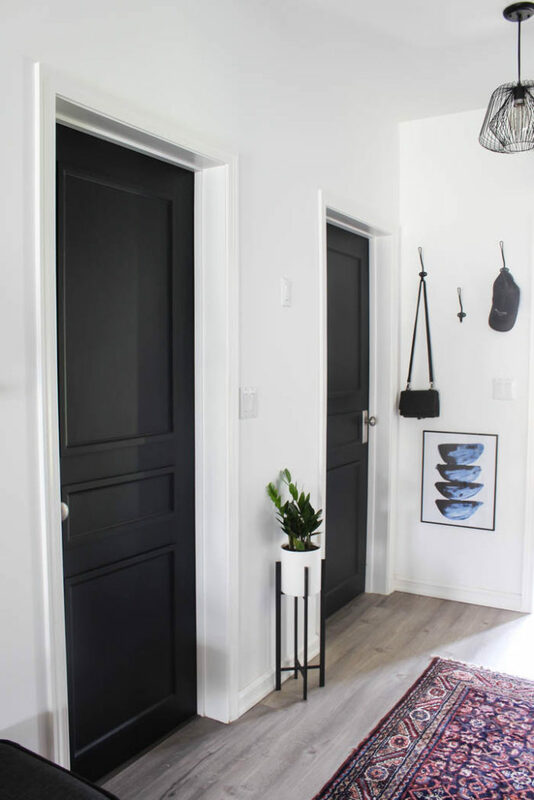 You all know how much I love Fusion Mineral Paint – so that’s what I used on these doors. They didn’t have the exact colour that I wanted, so I decided to mix colours a bit. I added 3 Midnight Blues and 2 Coal Blacks to create the perfect moody navy. I can officially say the hallway is done! One more room down… a whole bunch more to go! lol. I’m not the only one showing off this beautiful hardware! 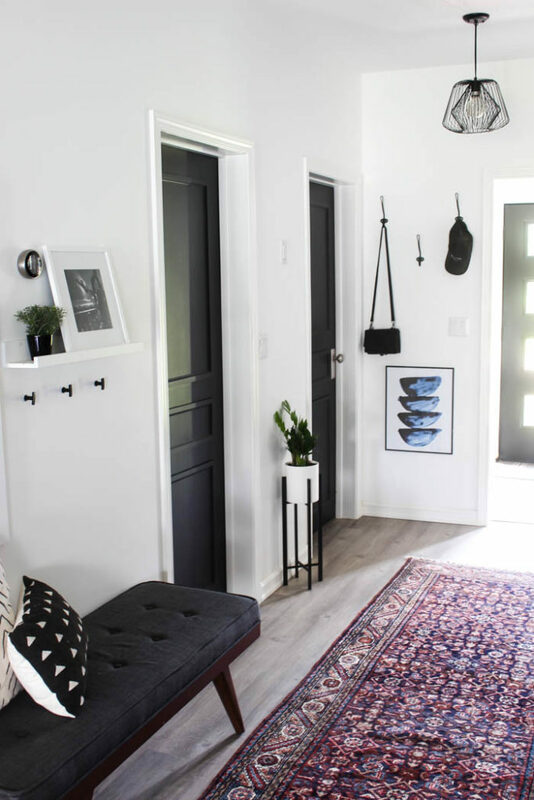 Check out what my Modern Blogging Friends did to update their homes! These doors look AMAZING now!! What trim pieces did you use? Aren’t they SO good!!! I used an Alexandria Moulding from Home Depot (3/8 x 1 1/4″)! Yes! The smaller one is smaller on my doors. I though it would look best if my handles were at the same level as my handles, which meant a smaller box on the bottom. Can’t wait to see what you do! 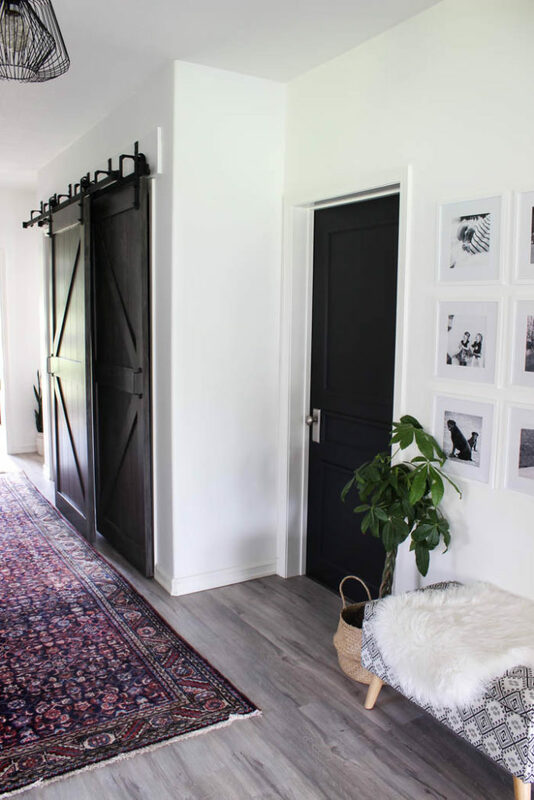 oh … I love black doors!! 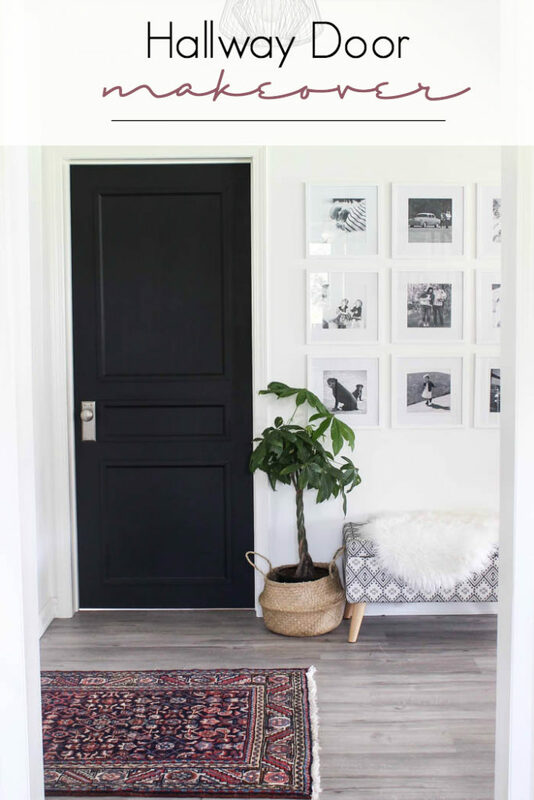 I live in a residential area – Do I paint my white faux wood doors black? Just three in a short crooked hallway. Glossy Black or Matt? I want to update the space and this seems like an affordable bite. Thank you so much! 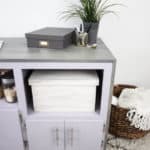 The bench is one that I just bought at Homesense! Sorry I can’t give a better source! Wow!! Such an amazing makeover girl! Thank you! 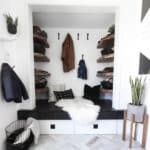 It’s amazing what a few small changes can do to a space! Did you also do the molding on the insides of the doors? You could, but we didn’t. All of our doors open to the wall so you don’t see much of them anyway. But we painted the inside the same colour obviously, lol. 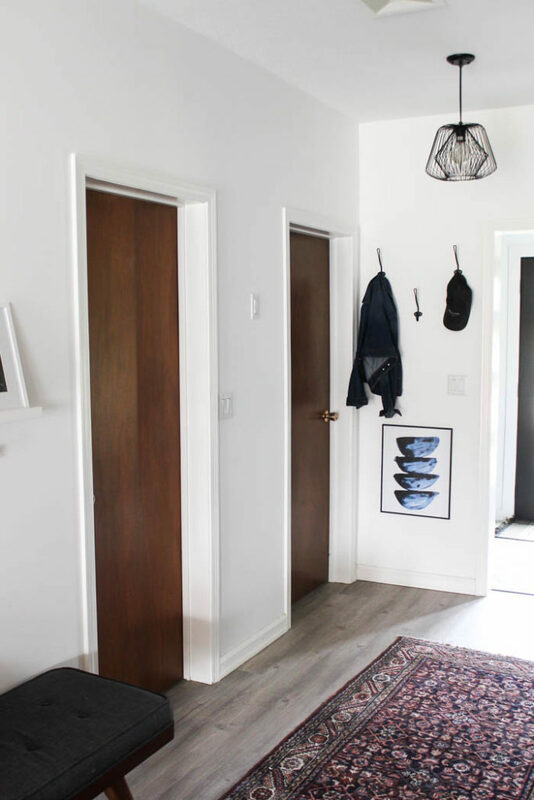 The doors inside the rooms… are those doors (closet or perhaps a bathroom door in the bedroom) painted the same color? If different, could you post a pic? 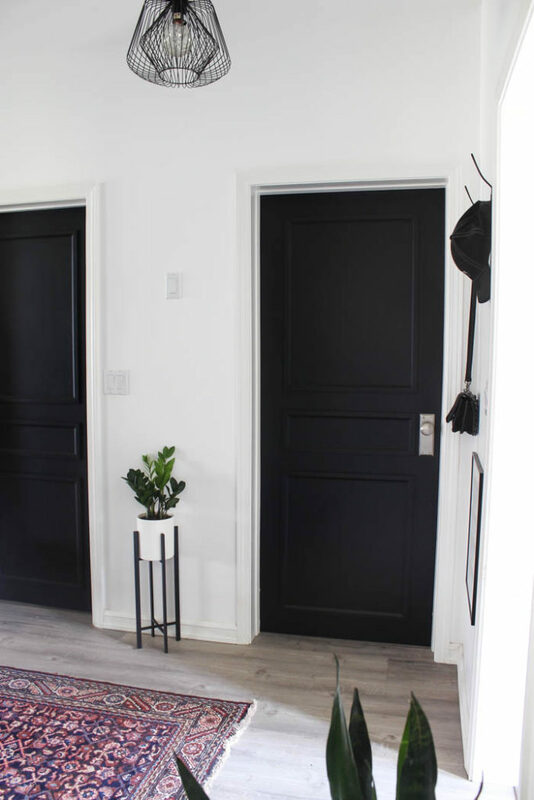 I want my hallway doors to our bedrooms to be black but prefer the closet doors inside the room blend in more and remain white. Thoughts? Yes! I don’t have a picture. But the closet doors inside the rooms are white, or will be white :) It’s perfect!